Whirlpool is the third novel in the Rational Series. The first was about a robot civilization that rose from a single robot that had attained consciousness after being created by a team of human programmers and how love clashed with rationality. The second was about a new species of rational humanoids (Rats for Rationals) evolved from our human species (Saps for Sapiens) that had been resurrected by the robots in the first novel. The Saps, in their prejudice and hatred, waged war against the Rats and lost, just as the Neanderthals lost to the Homo Sapiens. I’m really excited about the third novel. I think it’s my best so far, although it is much more challenging for my readers. I’ll try to tell you a little about it without spoiling the experience for you. 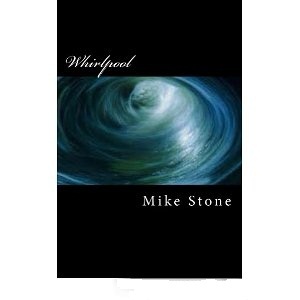 Whirlpool is an experimental novel, a kind of psychological science fiction story. There are three interwoven sub-plot lines whirling around each other which will finally come together at the end of the story. The first sub-plot involves the main character, an old man in an asylum for the insane in the year 2070. He is in love with one of the characters in a story he wrote. In fact he prefers the company of the characters he created to real live people. The characters of whom he is so enamored in this novel are the characters from my two previous novels. Of course he is in love with Ellen. He also seems to be moving backwards in time, but that is not so surprising in light of the fact that the whole universe is moving backwards in time. He turns to Lem and Yani for help. The second sub-plot is about a virtual being, called a Thot, who is traveling through space and time in a meme, which is a kind of capsule, to an unknown world on a deadly mission. We are sympathetic toward this Thot and admire his tenacity until, too late, we realize what his mission is. The third sub-plot, mostly hidden from the readers until the last chapter, is what is really going on in this story. Is this reality, or at least what passes for reality in science fiction and science fantasy, or is this the hallucination of a demented individual? The main character can’t tell. Can you? Why is this novel part of the Rational Series? What is the story’s connection to rationality? It explores the limits of rationality and the ultimate inability of rationality to rescue you from your own insanity. You can never be the person on the shore or the thrown life preserver, and the drowning person in the whirlpool.